Stadium comes first, and then comes the team. Built in 1877, Stamford Bridge has turned into a legendary battlefield hosting Chelsea F.C. The stadium depicts club’s glorious history and is the home of almost 41,631 of its dedicated supporters. Built in 1877, Stamford Bridge was initially the home of London Athletic Club. The Bridge began hosting the blues’ fans only in 1905. That was the year of Chelsea F.C. foundation by Gus Mears. Since that time, Chelsea has been occupying Stamford Bridge. The arena expects for a massive reconstruction in the nearest future to become Europe’s most expensive stadium. The reconstruction costs are expected to be up to £1 billion. 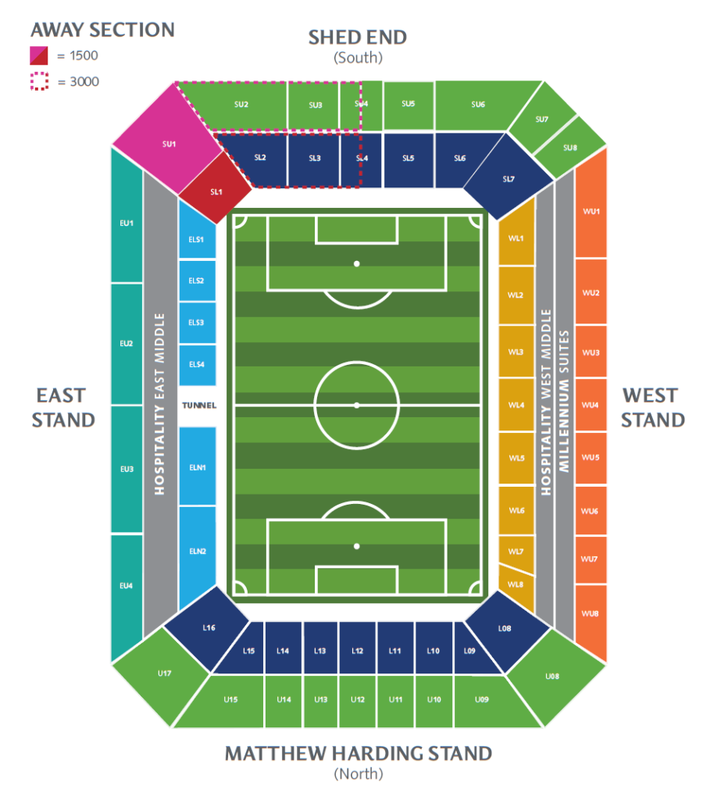 For now, it features a typical seating plan with four major stands including a section for away supporters. North Stand (Mathew Harding Stand). East Stand featuring hospitality seats above the tunnel. West Stand featuring hospitality and millennium suites. South Stand (Shed End) featuring the away fans section. Here at Stamford Bridge, the away supporters can always count on at least 1 500 tickets. The away tickets’ capacity reserves the space for extra 1 500 seats for the AA category matches. Buying Stamford Bridge tickets may be a daunting task. As a rule, they are sold out mainly due to club members. StubHub is an ultimate solution to the problem. It lets you buy tickets in advance and choose the best seats effortlessly. An intuitive interface, reasonable prices and great reputation on the web will guarantee your appearance on Stamford Bridge despite the match category. As for the ticket prices, they depend on the match category. Cat B games usually cost cheaper. The ticket prices start from £47.00 for lower-tier seats on North and South Stands. The same category tickets on East and West Stands are about £67.00 and higher. You can check the full information about tickets availability as well as membership on the official Chelsea website. It boasts some advanced features like ticket exchange. Simply create a new account to get an access to all Stamford Bridge ticket options. Each Chelsea game is an anticipated event for thousands of fans. They come from different cities and countries to support their beloved football club. For this reason, you need to think of a place to stay in advance. This is where Booking.com will come in handy. Use one of the most trustworthy hotel services to book the best-matching accommodation in London near Stamford Bridge. You can also check our list of best offers available at the moment. The Malt House – the best offer located 3 minutes from Fulham Broadway station. It is the nearest Stamford Bridge tube station. One night at the Malt House will cost you £135 for a double room with a private bathroom and breakfast already included in the price. Millennium & Copthorne Hotels at Chelsea Football Club – the hotel boasts posh twin and double apartments in addition to superior suits for those requiring maximum comfort. The 4-star hotel boasts amazing location (5-minute walk from the Fulham Broadway station) in addition to its 2 own restaurants and pubs. You will certainly appreciate marble bathrooms and luxurious fitting for only £192 per night. La Reserve Hotel – a cozy and smart hotel is located not far from major London attractions including the Big Ben and the Chelsea Embankment. At the same time, it will take you about 4 minutes to get to Stamford Bridge. The price here starts from £117.30 per night for a double room including an amazing continental breakfast. Charming Chelsea & Fulham Apartment – located 900 meters from Stamford Bridge, this hotel boasts an amazing London view as well as the most affordable prices. A studio apartment for 3 people will cost you only £99 per night. Guests can benefit from hotel’s own gardens and outdoor terraces. Stamford Bridge is far more “centralized” if compared with other London stadiums. Located in the Fulham district, it is only 20 minutes’ walk from the city center and less than 3 miles from the Buckingham Palace and other major London attractions and places of interest like Hyde Park. Visitors can benefit from various types of transport to get to the Bridge effortlessly. They include buses, tube, and trains. NOTE: Stamford Bridge authorities do not recommend using cars to get to the stadium, as there are no parking places available for drivers especially on the matchday. By Tube – Fulham Broadway is the nearest station to Stamford Bridge. It is located on the District Line. You can get there using several ways. The fastest is to take the train that departs from Earl’s Court station (Piccadilly Line). It will take you directly to Fulham Broadway station. If you are not in a hurry, you can walk from the Earl’s Court station. It will take you less than 20 minutes to get to Stamford Bridge. By Train – using overground trains is also a good idea considering two stations located next to the Bridge. West Brompton is the nearest train station. It will hardly take you more than 10 minutes to get to the arena from there. Imperial Wharf station is also located near Stamford Bridge. By Bus – fans can take various buses that will get them directly to Fulham Broadway station. You can choose between bus routes number 14, 211 or 414 depending on your location. Other bus lines are also available for visitors. Bus number 11 goes from Liverpool Street. Buses 28 and 296 are also passing Fulham Broadway station from Ladbroke Grove and Richmond. By Plane – six international airports welcome thousands of supporters from different cities and countries. Heathrow is the major destination for more than 75 million visitors per year. Here you can take a bus to get to the city center or nearest train and underground station. It’s so hard to park very close to Stamford Bridge due to the architecture of the area surrounding the stadium. However, there is always a solution. The approximate matchday paid parking price near the sports venue in London is £5. We have already noted that Stamford Bridge is very close to the city center as well as major London places of interest. It is not far from the Buckingham Palace, the Big Ben, Hyde Park and other attractions. It means you will never face any difficulties in finding a place to have a snack or a couple of pints. Choose from traditional British pubs, bistros, posh restaurants and coffeehouses concentrated around Stamford Bridge. The Butcher’s Hook – although located right next to Stamford Bridge, this venue boasts a fairly quiet and tranquil pub in addition to a selection of drinks. The atmosphere is rather cozy. It represents traditional interior for British pubs. It is certainly a good venue right opposite the Bridge to have a burger with a couple of lager pints. The Chelsea Pensioner – this legendary pub is a home for hundreds of Chelsea supporters. It boasts a rich history in addition to an extended list of beers. Located 4 minutes’ walk from the stadium, it is full of visitors. So, you ’d better come in advance to have your seat at the bar. Frankie’s Sports Bar & Diner – the venue combines some features of traditional sports bar and high-quality diner. Whether you want to have a good meal before the match or watch the game on the flat screen in a company of dedicated fans, you will hardly think of a better spot right near Stamford Bridge. The Rose Pub – once you have entered the venue, you feel like you are invited to a traditional English banquet. The interior is very smart and posh. Here you can have a dinner by the fireplace in a company of good fellows. Food is certainly a big thing here judging by the menu. Drinks include a selection of beers, hot drinks, and cocktails. 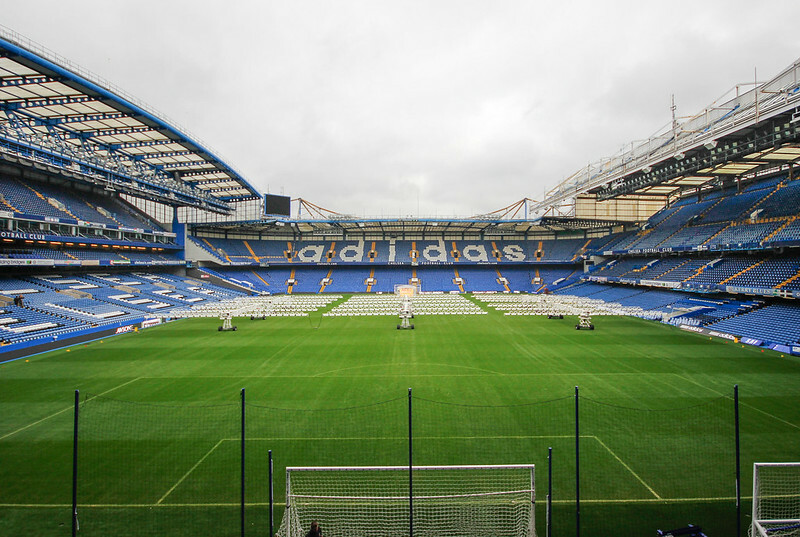 Stamford Bridge stadium tours offer different group and individual packages. They will take guests behind the scenes to witness the insights of one of the most glorious football clubs. You can choose from different packages and stadium tours including general admission, matchday tours, special events and more. You are free to book any tour right using a simple online form. We suggest checking the available dates in advance. All available Stamford Bridge tours last 60 minutes. Some of them include visiting Chelsea F.C. museum. You should check the tour program in advance. General attractions include visiting the tunnel, dressing and pressrooms, dugout areas and more. Matchday Tours – choose any Premier League match and get behind the curtain feeling yourself a part of the event. Guests can also opt for Legends’ Tour to meet some of the most iconic Chelsea players and ask them questions. You should check the tour availability in advance. The museum is located right next to the stadium. It offers several educational programs in addition to general admission. It welcomes guests from Monday to Sunday. The working hours are 9.30am – 6pm. Pay attention that the last admission is 5:30pm. Here you can see some of the Blues’ artifacts with your own eyes. They include old-school jerseys, photos of Chelsea legends, club’s trophies and more award-winning things. Also known as the Stadium Megastore, Chelsea fan shop is a huge marketplace of things dedicated to one of the most recognizable football clubs. The 12,500-square feet area hosts everything related to the Blues and the Bridge. Choose from printed T-Shirts including the latest versions for the 18/19 season, training and footwear, accessories, souvenirs and more great stuff. The store operates from 10am to 6pm. For those who are looking for ideas what to buy in a fan store and for those whose trip to Stamford Bridge stadium is being postponed, I wrote an insightful article “Top 40 Gifts for Chelsea Fans”. I’m sure you’ll enjoy these wonderful gift ideas. Great Britain gave a birth to football while London is the heart of the country. It is the home of world’s most recognizable attractions and places of interest. It hosts numerous historical monuments related to different epochs. London keeps the rich historical heritage of the country that has always been the main destination for millions of tourists from across the globe. Whether you are a dedicated football supporter, historian, architect or scientist, you will always find a place that will exceed your expectations. Start your meeting with London from the general sightseeing tour. It will let you see some main attractions, historical monuments, and buildings including the Tower of London, the Buckingham Palace, the Big Ben and some other places that have turned into a British signature. Tourist Bus Panoramic is a good option to travel around the city making stops at major destinations. Costing only £21.60, the tour will guide you through Downing Street, St. Katherine’s Pier, the London’s Museum, and Westminster Abby. As a rule, the sightseeing tour is available round the clock. A good news for those who are not planning a long visit. The London Eye – the attraction is the best bet for those who appreciate live panoramic 360-degree views in real-time. Get to the 135-meter height to observe all major London’s attractions as well as the Tower Bridge. The London Dungeons – think you are brave enough to go deep underground? The London Dungeons will make you shiver with fear, as Jack the Ripper may hide somewhere by the next corner. The attraction will take you back to the times of Sweeny Todd and old London streets full of legendary killers, pickpockets, etc. The Natural History Museum – you will never have another opportunity to see specials of mammals that lived 50 million years ago. Over 100 different animals are displayed in the museum including the weirdest ancient creatures you have never heard of before.